An overview of a family visit to Six Flags Hurricane Harbor in Jackson NJ with small children. Read about what you can do there with a 4-year old and a 1-and-a half year old. The water park is lots of fun for young kids, no matter their age. Between the big wave pool, the Discovery Bay children playground with miniature pools and slides, and the relaxing Lazy River, there's lots to do for everyone on a nice summer day. If you were ever wondering what’s a good age to start bringing your kids to the Six Flags Hurricane Harbor water park in Jackson, NJ, here’s a review of my experience taking mine for the first time there. One is 4 years old, the other just 1 and a half, and they both had a blast! The main area for little kids is Discovery Bay, an expansive playground with climbing structures, big pools with water toys, various slides, all surrounded by dozens of lounge chairs for the parents to set up their “base”. The Bay welcomes kids from small toddlers who are just starting to walk and enjoy splashing in the water, to 6-7 year olds who are either too short for the big slides, or not brave enough to tackle them. First, there is the mini-wave pool, where the water is less than 6-8 inches. Even the youngest kids are free to roam around here safely, splash the clear water, laugh at the sprinklers, or play with the hand pumps, water wheels or little waterfalls. There’s another such pool around the corner, where you also find the small slides. They’re no bigger than regular playground slides, only that you land in the pool. Bigger kids can easily climb on the pirate-ship shaped central structure and try the various slides, but you can have a lot of fun even with a 1-year old, sliding with him in your lap. Mine loved it and had us go over and over. The big climbing structure allows 4-6 year olds to go up on netting, ladders or regular stairs, and then try the miniature slides. They are shaped like the big ones, with twists and turns, tunnels or big drops, but you never get really fast, and they start from just between 15-30 feet up. There’s no tubes, kids go by themselves down the water slides with just a lifevest if needed. Note that they must have the courage to go alone since parents can’t slide together with them. And of course, on top of all of this there’s the huge water bucket which will fill up and then dump a rainstorm over everyone waiting below. Definitely not fit for very small kids, but many adults have fun there. There’s also a miniature bucket for little ones, which releases a lot less water and can get kids accustomed to the experience. Not far from Discovery Bay is the big Blue Lagoon wave pool, which attracts visitors from all ages. You see mostly adults here, especially in the deeper end, but behind them there will be younger and younger kids, up to toddlers right at the edge where you can barely feel the waves. I wasn’t really expecting my kids to love it so much, but they just didn’t want to leave. It’s a very safe environment despite the huge crowds (must’ve been hundreds of people in there), with clean clear blue water. My 4-year old got braver and braver heading into the deeper water, and the periodic waves entertain everyone. The toddler stayed near the edge but he was also attracted to deeper waters as his confidence was gradually growing. With the right water toys, you can keep your children entertained here for a very long time. 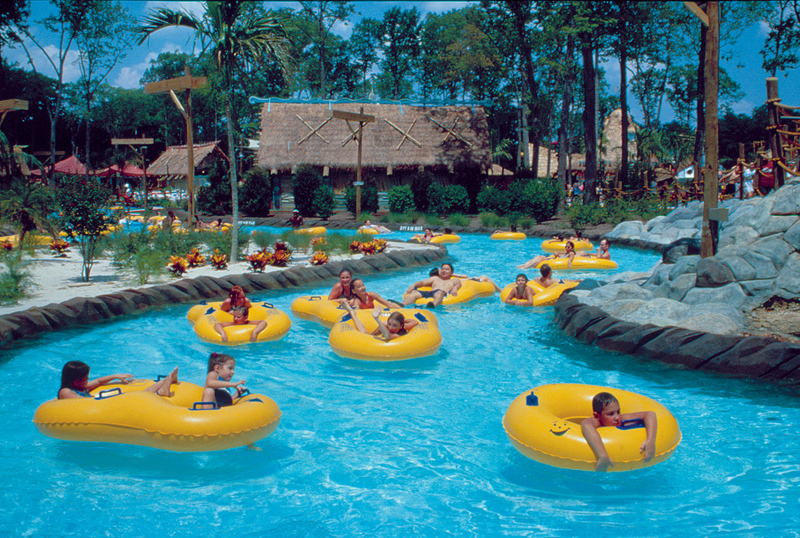 Of course, no trip to a water park is complete without a few relaxing laps on the Lazy River. The one at Hurricane Harbor can get very crowded on a hot summer weekend, but it’s still very enjoyable. The entire family can go around on a double tube or a couple of single ones, as the river weaves through the park, under bridges or waterfalls, and at times through a lush tropical landscape. You also get a peek of some of the main attractions, like the tall slides or the new King Cobra. The water isn’t deep, so you and the older kids can easily walk around or try swimming. It’s nice that they don’t mandate lifevests for everyone like other water parks (which can deter some small kids from enjoying it). In my case, I sat in a tube with the 1-year old on my lap, and it was a great experience for both of us as we were flowing and spinning down the river. So you don’t have to be reluctant of going to Six Flags Hurricane Harbor with small children. Yes, it will be different from when you didn’t have kids and could go to all the thrill rides, but if you want a relaxing family outing, it’s the perfect place. We spent four hours there, and could’ve stayed more if it weren’t for the little one’s overdue nap time. Between the shaded lounge chairs, the pools, the river, the eateries, the fun never ends!